Solar Capital De Aar 3 is funding a highly successful community initiative to improve the reading skills of local children in the Emthanjeni Municiaplity. The programme, Do and Learn, supports 220 disadvantaged primary school children and has been implemented by a local non-profit organisation, the Karoo Eisteddfod Trust, for the last five months. 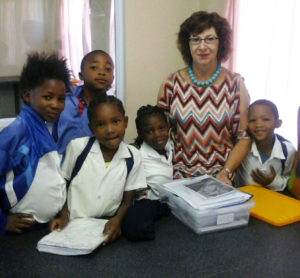 The programme recruits local volunteers from De Aar who are then trained as reading coaches. These coaches hold classes at various schools in the larger municipality on a daily basis. Tests have shown that the average speed at which a child involved in the programme reads has improved by 51% in one month! Research has found reading to be the most important skill ensuring academic success. To be able to read well means a child needs to develop better memory skills, higher comprehension ability and more confidence. Unfortunately, the majority of South African schools are filled with students who have been left behind, have poor reading ability and experience school in a negative way. Many of these learners continue to struggle in all subjects and later drop out. As this reading programme has shown, a child can improve his or her reading skills at a rapid rate when given the necessary attention and tools to do so. This will have a direct and positive influence on the academic ability of the children not only at primary school, but for the rest of their schooling and tertiary studies. We thank the Karoo Eisteddfod Trust and the amazing volunteers for all that they are doing!